Treat yourself to some tasty fried treats every now and then. When you have that craving, nothing else will do. Whether it's crispy fries, savory chicken or a classic pile of cheese curds, Wisconsin does fried food right. From hole-in-the-wall diners to downtown pubs, here are our favorite places in the state for yummy fried food! Located near—you guessed it—a river, River Rats offers a view of the roiling mighty Mississippi. Head out there in the summer to listen to live music on the patio; arrive by car or boat! As for fried food, River Rats offers a great bar menu filled with fried favorites—cheese curds, tacos, wings, river tots, fried green beans, and more. At Toby’s the appetizers aren’t the only dishes that are fried; try the fried chicken or the fried fish to mix up your palate. The menu also boasts French fried shrimp alongside all of the fried-fish options, baby pike, blue gill, and lake perch. Don’t forget to order fries to make it an all-fried meal. Grab a brew, watch a game, and snack on some apps from Titletown Brewing Company. Enjoy the pork rinds, freshly fried and served with a side bottle of hot sauce and your choice of a dry rub, or the bacon mac rolls. Wear your loose pants because those bacon mac rolls are stuffed with mac ‘n’ cheese and bacon and dipped in curry ketchup—you’re going to need the extra room. According to its website, Galloway Grille is “the old school destination for contemporary comfort food.” Found in the heart of downtown Eau Claire, the Galloway offers so many shareable fried appetizers. Try the deep-fried battered pickle spears, the battered portabellas, classic onion rings, or cheese curds. This pub offers classic appetizers with a twist. The spicy jalapeno cheese curds are a perfect fried-food first course for hungry diners. Instead of each ordering an entree, try a few different appetizers—onion rings, fresh chips, mozzarella logs. And don’t forget the Bloody Mary! If fish fries are your thing, then stop at Barkley’s any time on Wednesdays or Fridays; those two days offer all-day fish fries! Otherwise take a seat at the bar, order up a brew, and try the fried cheese curds, mini corn dogs, mozzarella sticks, cream cheese poppers, or the fried dill pickles. According to the Spats website, the establishment has been around since the 1920s, offering a place in town for folks to mingle and visit. As for fried food, Spats, like every small-town bar in Wisconsin, offers cheese curds, of course. Also try the deep-fried mini crab cakes, or the “Black and Blue” fries—fries topped with crumbled blue cheese, bacon, and a special sauce. According to its Facebook page, most visitors are looking for Madtown’s “best fried chicken in the Madison area.” The menu has a simple layout with a “build-your-own” feel. 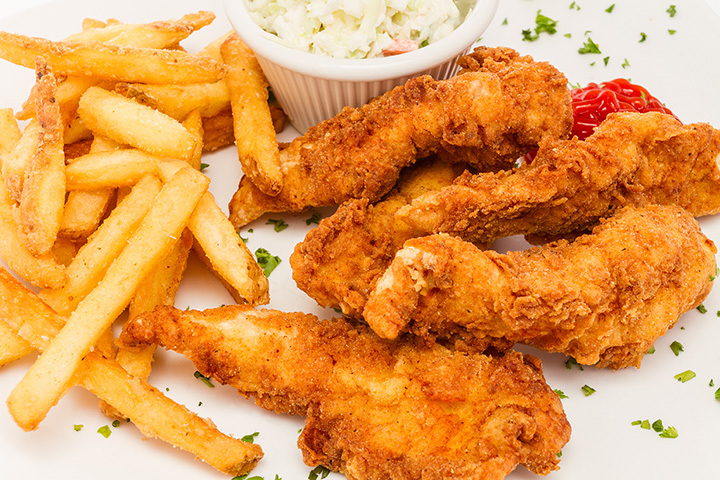 Order how many pieces of chicken or fish you would like along with sides and extras. Found on the northside of La Crosse, the Hungry Peddler is a household name for those who grew up in the area. It serves a plethora of fried-seafood options including, batter-fried catfish, batter-fried shrimp, batter-fried scallops, and batter-fried cod. Enjoy pub-style fried-food starters at Hilltop Pub & Grill. Make a day of it, and invite your friends for a lunch date. Try the unique fried cauliflower, the Italian Pizza fry, mini chicken corn dogs, or brew city onion rings. Hilltop doesn’t mess around with its fried food—rather it prides itself on what it has to offer.